The Ministry of Communications and Media suggests giving major domestic IT companies strategic status, in order to prevent takeovers by foreign investors. Owners of IT companies are not over-enthusiastic about this initiative, however. One of the major risks for the Russian IT sector is domestic companies being taken over by Western giants, according to a draft development strategy for 2014-2020 proposed by the Ministry of Communications and Media. The ministry suggests including “a few” of the domestic IT companies on the list of strategic enterprises of the Russian Federation. Companies on the list would face serious restrictions: Foreigners would be unable to gain control of them unless they had authorization from the government commission for foreign investments, which is headed by the Russian prime minister. Russian IT companies welcome foreign investments. In 2013 alone, two major deals were completed. In July, Luxoft, a Russian software development and IT outsourcing company, made an IPO on the New York Stock Exchange, selling 12.5 percent of its capital and raising $69.6 million. In August, Maykor, the leading Russian IT outsourcing company, raised $100 million in investments from a group that included the EBRD and the Finnish Capman. This never happened, though, and it was in 2009 that Russia’s biggest search engine, Yandex, sold a “golden share” to Sberbank. In 2012, some State Duma members suggested giving major Internet services and all printed media strategic status (the list currently includes television channels and print media with a print run of over 1 million copies). The founder and chairman of NVision Group, Dmitry Taraba, believes that only those companies that develop unique hi-tech products and supply cybersecurity solutions should be listed as “strategic.” This might apply primarily to Kaspersky Lab, according to Taraba. NVision also runs divisions dealing with cybersecurity and innovation, so their operation could also be considered strategically important. Yet there is no point in safeguarding system integration, as domestic integrators have proved capable of standing up to major global players, the NVision founder says. Natalya Kasperskaya, general director of Infowatch and co-founder of Kaspersky Lab, shares this view. She believes that efforts to protect the IT sector should focus on some of its segments — specifically, developers of antivirus software and supercomputers — because it is via these segments that access can be gained to government data. Kaspersky Lab representatives were unavailable for comment. Alexander Kalinin, president of NKK (topped the CNews list of the biggest IT companies in 2012), said that the benefit of including IT companies on the list of strategic enterprises was questionable: The label limits a company’s ability to raise investment. An open market is always broader and offers better prospects, Kalinin says. According to Dmitry Komissarov, co-founder of Rosa (developer of the Russian open source operating system), unlike the oil and gas industries, the IT sector only has human resources. A company can be allocated strategic status, but this will not stop its employees from leaving the country. The United States and Western Europe have long been aware that local Internet and IT companies are extremely valuable assets, with a role in the country’s economy just as important as that of oil companies, says president and founder of IBS Group Anatoly Karachinsky. Yet, to protect them against foreign investments is a bad idea. Karachinsky believes it is important to encourage foreign companies to bring their business to Russia—to have major projects implemented by professional companies rather than unknown entities affiliated with customers’ managers. If Russia wishes to achieve digital independence, then, according to the IBS president, the state should support local companies’ development efforts, including by giving them big state contracts. Even so, Russia has no sensible IT policy: For instance, Luxoft supplies software to the leading research facilities of the world, has considerable expertise in the aeronautical industry and telecoms, but has no Russian customers, Karachinsky says. More: Can ‘Russia’s Google’ survive its great loss? Deputy Communications Minister Mark Shmulevich tells Vedomosti that it is not yet clear whether the proposal by the Ministry of Communications and Media will make it into the final version of the strategy. The ministry will discuss the document with the government in late October. 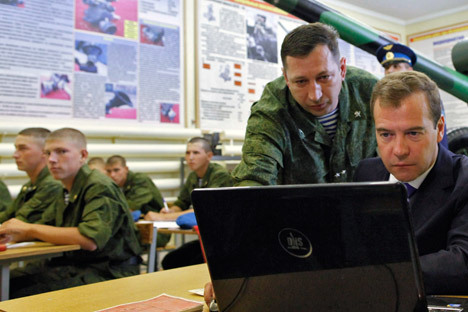 The IT sector is supervised by Deputy Prime Minister Arkady Dvorkovich; his spokesperson, Alia Samigullina, and the spokesperson for Prime Minister Medvedev, Natalya Timakova, declined to comment. The decision to include a company or industry on the list of strategic entities is made by the president; Vedomosti was unable to reach the spokesperson for the president, as well.